Cinnamon chip topped version of cookie brittle or cookie bark. Line a heavy duty 13×18 inch baking sheet with parchment paper or a Silpat. In a mixing bowl, vigorously whisk the egg whites until very foamy or beat them with a handheld mixer. Gradually whisk in the sugar, then whisk in the melted butter, oil and vanilla until smooth. Whisk in the salt, baking powder and cinnamon, then whisk in the nonfat milk powder and flour. Stir until smooth. 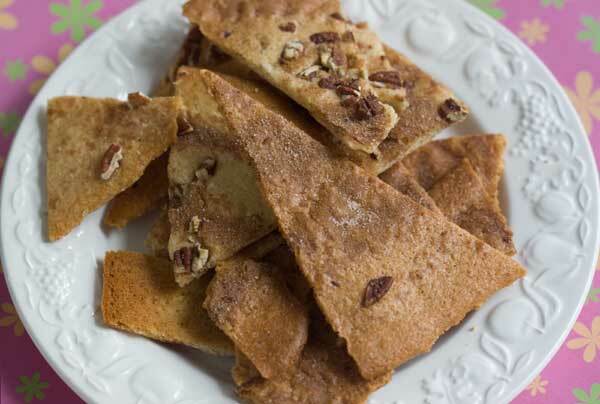 Scatter cinnamon chips and pecans over the top. Bake in the lower center of the oven for 20 minutes, checking at 17 minutes. Edges should be brown but not burnt. Remove from oven. With a pizza cutter or knife, immediately cut into pieces without separating (careful if you're using a Silpat!) – you want shards, similar to what you’d get if making peanut brittle. Cover loosely with a sheet of foil and return to the oven for another 8 minutes. Let cool for 5 minutes on baking sheet, then carefully lift pieces and transfer to a wire rack to cool and crisp. If you are left with a few thick, chewy, pieces, return them to the oven and bake at 250 for 20 minutes, then re-cool. If your batter is thin enough the first time, you should not need the second bake. If you are using a Silpat instead of parchment paper, be careful not to press to hard when cutting with the pizza cutter so that you don't cut the Silpat.